Just over two weeks ago, I couldn’t sleep. It was just before the lunar eclipse, and I was awake during the early pre dawn hours for several days in a row, which felt a bit uncomfortable as I’m still deep in the long-term sleep deprivation of mamahood. On the third night of awakening, after lying awake for an hour, I surrendered and got up at 3:30am, as I persistently felt and clearly heard the call to sit. I’ve been sitting a lot lately, and it's been my grounding grace, almost as a white flag in the ocean of energies. I nursed Jupiter and then went upstairs to my studio with some water and candles. I sat on my zafu, gathered my senses and began to tune in. Sitting felt amazing, as I came more and more into alignment with the subtle realms of my body and being, with little pops and tweaks clearing my channels, releasing and opening. I’ve had about 5 or 6 different meditations, or shamanic journeys, that have been total game changers, and this morning already felt like another level up. I immediately and clearly heard the message that 4am was the best time for communication, as there was minimal psychic interference from people, cellular and wifi technology, and chem trails. I was deeply comforted by my guides strong presence and welcomed their suggestion of some “upgrades.” As I moved more and more into a witness perspective to their presence and offerings, I experienced a full warming, it wasn’t quite physical, but a visceral tingling enveloping my being. It felt like a clearing, a rewiring, a full hard drive reprogramming, like some psychic alien surgery. I felt a clearing of my sinuses throughout my head, and a tuning of the frequency spectrum my radio head was picking up on and broadcasting. I just sat back and watched it all happen. I settled into the fields even further, feeling my meat suit lightly breathing for me back on Earth, and I melted into consciousness until I … I … I … I moved beyond I, into a vision of the time space dimension forming beneath wherever “I” was. In a realm of light, a large, rotund man with long black hair presented himself to me as my guide. He had a Samoan energy, with a strong protective presence. I asked his name, which I tried to ‘psychically’ pronounce several times (something like Waponapa, Waponomaj? ), and he asked why it mattered? So I could feel proud of my psychic messages and my clairvoyance? He told me he could have any name I wanted and to not be attached to those details. He stood at my left shoulder and told me now was the time to follow through with my idea. This idea was inspired by my muse, Emma Kunz. She was a Swiss healer and artist, but she didn’t consider herself an artist, rather art was the tool for her healing practice. She created large square drawings of geometric mandalas that were prescriptions for her patients. In 1942, she attempted a distance psychic healing session on Adolf Hitler. Whether it had any effect or not is, of course, subjective, but he died three years later, ending the accumulation of karma in his current life. Through 8 years of practice, I have come to learn this technique, carefully studying quantum realities, with many tests and trials. I feel very confident in the real abilities of this practice and the very real effects, and I have started to take students to pass along this technique. And so, inspired by Emma and protected by my bodyguard, I psychically asked Donald Trump’s spirit if I could have his permission to work with him. He agreed, sort of shrugging in his usual chum way, giving off an energy of ‘what the heck, I love any and all attention.’ He had a squinty grin and an unexpected warm softness to him. I was then urged by my guide to offer a Reiki I attunement, which I also wasn’t expecting, and which is different from a normal Reiki session. I had no attachment to these instructions and I offered the attunement. It is a sacred activation of psychic channels that can only be performed by a Reiki Master; a rite of passage that enables the recipient to open to the Reiki channel and offer it to others. Trump was a little hesitant in his energy, but he sat and received anyway. It was the most clear, most powerful attunement yet, the 23rd first degree attunement I have offered. I had no expectations of results or proof of some sort of shift within him, I just offered without any need for anything in return. After it was over, I sealed up his field and repaired his aura with thousands of tiny stitches. A mother goddess energy whispered “seal him up in a golden egg, for I have birthed him too.” I then bore witness to myself embrace him, and I deeply knew he needed to be loved. Not some blind sheep savior praise, or some gold digging bought love, but true, radical unconditional love. He is my brother and I am his sister. We are both humans, with hearts, standing on a very sacred and special jewel of a planet. What a beautiful miracle and true gift it is to be in a body! I got a tiny taste of truly grasping just how special it is to be alive, breathing, seeing, feeling. These are the precious fleeting moments of our lives. It is up to you and me to create our collective reality. There is no room for anger anymore. There is no time for fear. This life and this planet deserve nothing less than pure, radiant love. Revolutionary L O V E.
Can you truly say I love you Donald Trump? You are my brother. Not deny giving his name any power, not protesting his lashings out for love, he needs love. Desperately. Now. All of us need this love. Now. This radical love is the key to freedom, truth, creativity, justice, abundance, empowerment, and all the blessings to achieve anything we want for our lives. When I came out of the meditation, I was so warmed and illuminated by this attunement to love. It flooded my heart and I was buzzing with life force bliss, ready to share the love with every brother and sister in my field. This is not some abstract performance piece, but it feels like an art. It's a quiet, outsider art, exhibited in other dimensions, beyond the visual frequency spectrum, and I feel it's some of the most important work I do. The sun was coming up, and I was settling back into the Earth realms. I went for a bike ride along the Clear Creek to get my blood moving and ground in some exercise. About 15 minutes down the trail, I hadn't seen any other riders out, and all of a sudden, perfectly placed in the middle of the bike path was a mallard duck. It was so odd, just precisely in the center of the path, all tucked up and his head gracefully resting on the concrete. I have no idea how he passed, there was no indication of any trauma. I put the bike down, and picked up the duck to move him off the path. He was still warm and soft. I placed him on an old tree stump and surrounded him with an offering of a leaf mandala, flowing with Reiki and blessing his journey to the Spirit realms. 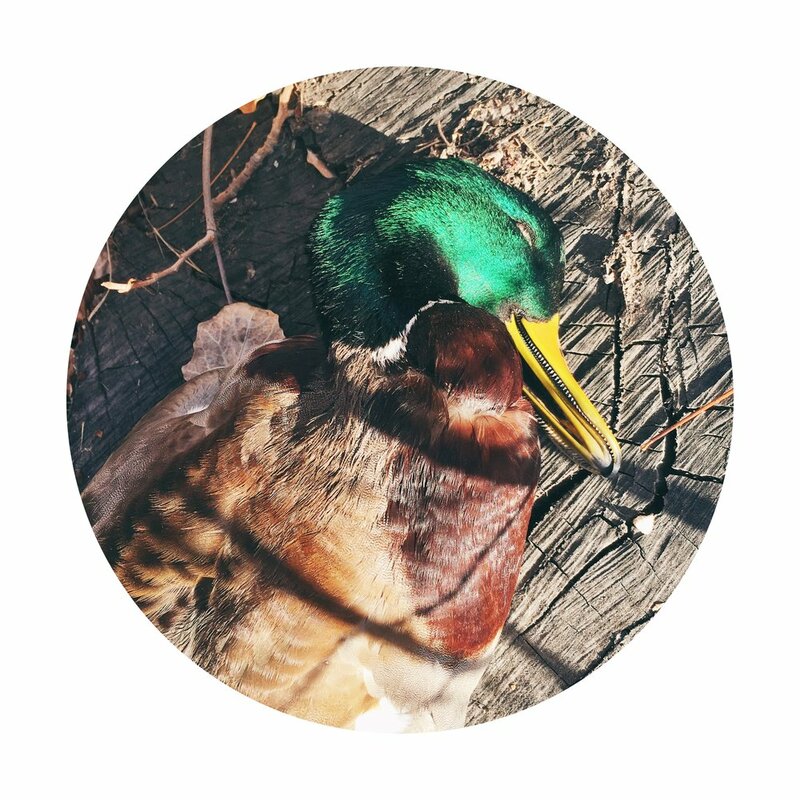 His brilliant, emerald green head was mesmerizing, shimmering in the early morning sunlight. He was so peaceful and full of grace. I didn't take any of his feathers and he told me to leave him for a fox. I've worked with so many bird medicines over the years, more than any other medicine family, and I've never been blessed with duck medicine before. I hopped back on the bike and started to head back towards home, deeply moved by this moment with his majestic spirit. And then it came to me ... Donald Duck. Of course, this is related to my vision offering. In seeking more understanding of this experience, I turned to one of my teachers and found solace in her wisdom. She spoke of the male liberation that is currently unfolding, the awakening of the divine masculine. It looks a bit different from the women's liberation in the 60's, and it's not being so publicly shared just yet, but it's in the beginning phases, and it's beautiful to witness. More and more, I am meeting men who are unable to follow the very outdated path of the suit and tie, nine to five, absent all day long from his family, expected to provide everything, and maintain a stronghold on his emotions. He doesn't want to play these antiquated roles anymore, and he has a lot of emotion to release with no real anchor in how to navigate those waters of anger, guilt, disappointment, shame, and sadness. He's finding his voice in what he truly wants to express and create, rather than what he's felt he should express as a man. In the past few days, it seems like there has been a shift in the energy, however subtle and minute that may be. I have no expectations or attachments to the work or results, but I'm going to keep returning to this idea of playing with the fields and offering energies. Maybe it's all a projected computer simulation, and we are all experimental creations of some directing force or extraterrestrial species. But I'm standing at the Truman Show wall edge, watching this all unfold, and I think I've tripped the matrix. I sense there's a few of us doing it across the ley lines, us humble members of the Family of Light. A few days ago, my beloved partner Ahmad returned from his third pilgrimage to the Amazon jungle. He completed a deep plant diet immersion with the master plant Tobacco, drinking 7 medicinal doses of Tobacco tea, over the course of 5 days in isolation. The Tobacco plant spirit is masculine, and he experienced a tremendous healing in his masculine energy, with the balancing assistance of Grandmother Aya and Grandfather Wachuma. He has returned a grounded man with a knowing in his eyes, and a tremendous love in his heart. Before he left for the jungle, we struggled through some of the darkest shadows of the self and relationship. But love overcomes. Love clears, heals, balances, harmonizes, excites, inspires, and empowers. It is the breath of your being, the essence of your incarnation, the reason for this beautiful sensory and physical experience we're all in. I've been taught by my most respected teachers, and by the plants, that the only way we can ascend is through relationship. We need a mirror to see the deepest parts of ourselves. Patterns, judgements, boundaries are transmuted into trust, faith, and truth. Love eases challenges, vulnerability becomes safe, and we grow into a better self. Heal your past pains, stay open, know that you are worthy of true love, and it is the reason for this miracle life. Love is the only true medicine. I love you.